It looks like I'm going to have to figure out a whole new game plan for Sydney and I. It's been a week since the child has taken a nap. . . she went from napping 3 hours a day to no nap cold turkey. I'm hoping that maybe now she'll go to bed earlier and that I can get my sewing and Etsying done in the evenings. We shall see. 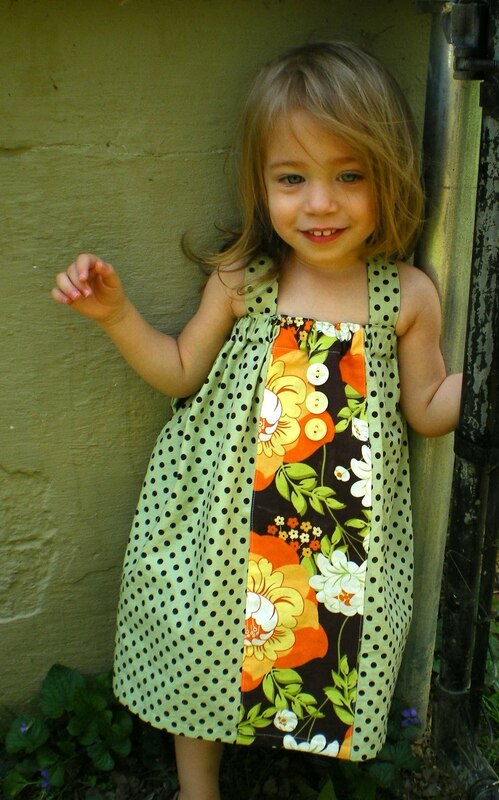 In the meantime, I've managed to finish up a dress for Sydney. I'm really excited about how it turned out. I used a pattern by Zozobugbaby on Etsy. I made the dress using "scraps" my friend sent me. 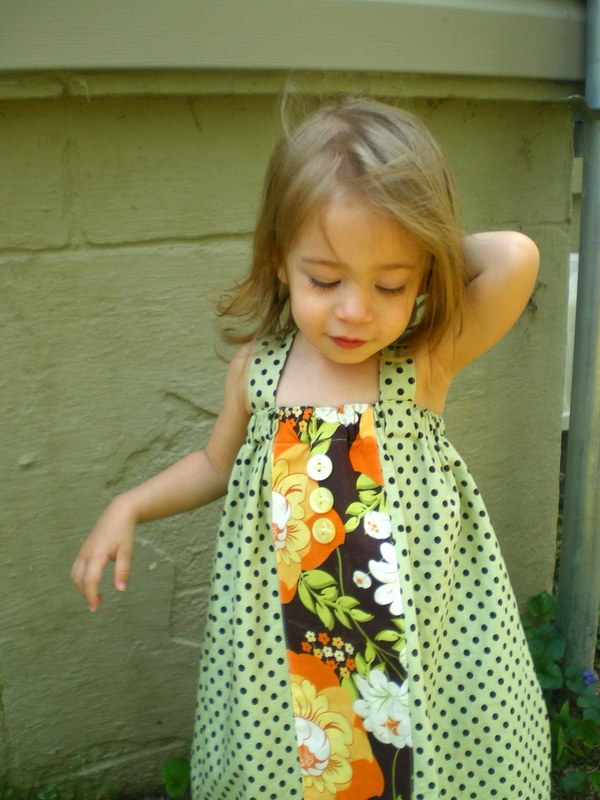 All in all, a very easy pattern to follow makes a great little dress with lots of possibilites. I love that it has adjustable straps so Sydney will be able to wear this for years. I made a few small changes just because. 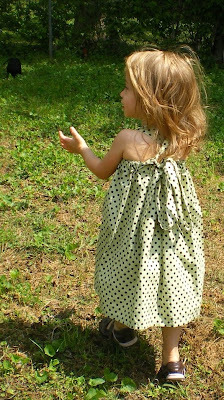 I moved the seam from the side of the dress to the back and sewed the straps in a little different to avoid having raw edges. Raw edges bug me! I'm pretty sure I'll be making some more of these. Coming soon. . . a new tutorial! 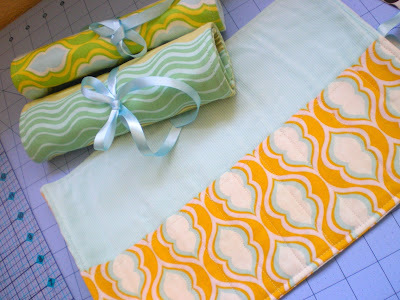 A reader emailed me about a pattern for the make up brush roll I made a while back. As soon as I regroup from losing my midday break, I'll be making up a tutorial for the make up brush rolls. It's super quick and simple and would make a great gift for the make up lovers you know. 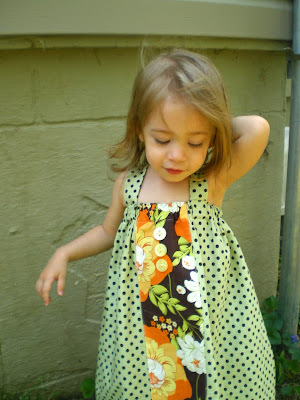 the dress is soooo so cute, might have to buy that pattern, too! quit it already! heeheh. Oh no! I'm really not sure what I'll do when Lauren stops napping . . . I'll lose my sanity for sure! I just love the dress you made for Sydney . . . ADORABLE!!! Oh, and I like your new header, too!